Psoriasis is a skin disease that causes an excessive buildup of dead, dry and rough skin cells that are typically reddish and covered with silvery “scales,” according to the University of Maryland Medical Center. Psoriasis is often a painful chronic condition that is most severe on the scalp, groin, lower back and joint areas. In addition to many different creams and topical ointments, dietary changes, prescription medications and ultraviolet light therapy, psoriasis patients can take several different supplements to ease their symptoms. Taking 10 g per day of fish oil can help to relieve psoriasis symptoms, says the University of Maryland Medical Center. 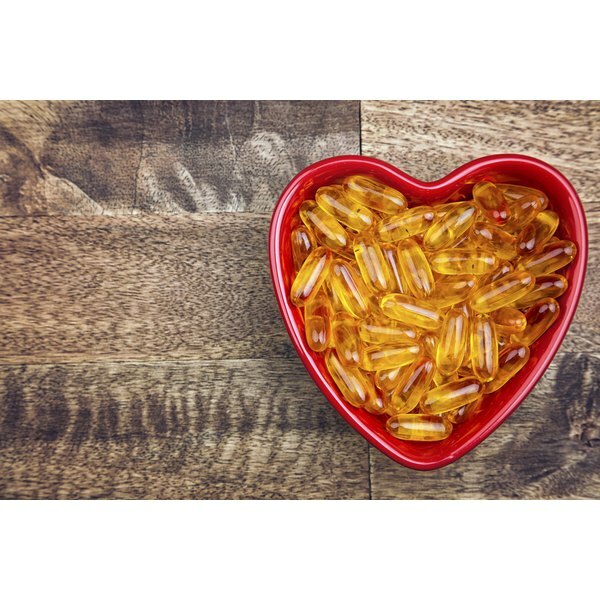 Several clinical trials have found that taking fish oil supplements can improve skin lesions, as well as reduce redness, scaling and itching related to psoriasis, according to the University of Michigan Health System. Fish oil supplements can also prevent increases of triglycerides in the blood due to the side effects of some medications used to treat psoriasis. A few studies found no improvements in psoriasis symptoms from taking fish oil supplements, however. Taking high amounts of folic acid, such as 20 mg taken four times per day in combination with vitamin C supplements, can significantly improve psoriasis within three to six months, according to preliminary studies cited by the University of Michigan Health System. The University of Maryland recommends taking 400 mcg per day of folic acid for psoriasis. Psoriasis sufferers who take methotrexate, a commonly-prescribed medication that reduces inflammation and skin cell growth, may need to take a folic acid supplement due to the medication’s side effects. In case studies, preliminary clinical trials and double-blind trials, fumaric acid esters have proven to be effective in treating psoriasis symptoms, says the University of Michigan Health System. However, fumaric acid esters can have serious side effects that can even lead to toxicity. Preliminary medical studies indicate that taking shark cartilage, or chondroitin sulfate, can ease the symptoms of plaque psoriasis, says the University of Maryland Medical Center. Taking 80 to 100 g per day, divided into two to four doses, can help with plaque psoriasis, but people with diabetes shouldn’t take this supplement. The University of Maryland also cautions that shark cartilage supplements can be expensive and may interact with calcium supplements. Taking vitamin D supplements isn’t usually necessary because prescription medications for treating psoriasis typically contain high doses of this supplement, notes the University of Maryland Medical Center. In severe psoriasis cases, however, taking vitamin D supplements may be necessary to reduce skin lesions and prevent the excessive production of skin cells, says the University of Michigan Health System. Activated forms of vitamin D can be taken orally or applied topically to the skin, the latter method being safer and less likely to cause toxicity in patients taking other psoriasis medications.